Hope you all had a great Easter- It was a bit too cold for me , fingers crossed for warmer weather soon in the uk. This week at Whimsical Wednesdays, We would like you to make a shaped card. 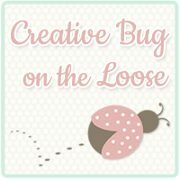 We are sponsored by "Creative Bug on the Loose"
and the winner gets four digi stamps. I had a look on the internet for inspiration and then make my own . I used an old fashioned circle template with lots of circles in different sizes to cut the eyes and then punched circles cut in half for the feathers on its chest. I think she will like it anyway. I used some liquid pearls in white and then covered the whole eye in glossy accents. I rubbed in a little stickles glitter glue onto the circle "feathers"
And used some of Stephanie's sentiment stamps inside the card. Your daughter is going to love this adorable owl card. Great job with his eyes! You sure did get ambitious with this going old school with the punches and hand cutting, you go girl. Great inspiration!!! Sue, this is ADORABLE! What a cool "shape" you chose! Love the glossy elements! Super cute card!